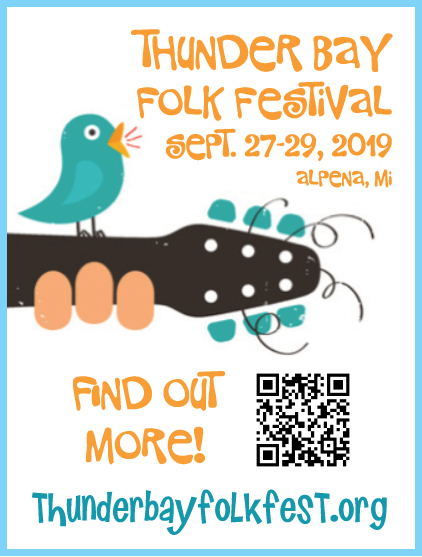 The annual Thunder Bay Folk Festival is a great, small and family-friendly festival located in beautiful Alpena Michigan. Join us for 2 days of live music on 3 stages, music and craft workshops, food and art vendors, children's activities, mind/body workshops, a community bonfire, a drum kiva, and so much more. New this year! A Dedicated Mind/Body tent! You won't want to miss this! We are dedicating a tent entirely to Mind/Body sessions led by Northeast Michigan's favorite yogis. Check it out! All sessions are included with the price of admission to the festival. Weekend and Day tickets are available at Neiman's Family Market and Joel's Guitar Shop, both in Alpena or online at Eventbrite. Save $10 - Buy an Advance Ticket! Get the Folk Society news and updates delivered to your inbox! Copyright © 2014-2018 Thunder Bay Folk Society. All Rights Reserved.